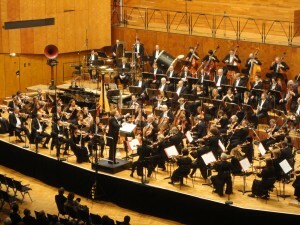 Stéphane Denève is the Chief Conductor of the Stuttgart Radio Symphony Orchestra (SWR). He made his debut with the orchestra as a last-minute substitute for the indisposed Michael Plasson in October 2009 and immediately became the orchestra’s choice to succeed Sir Roger Norrington as the Radio Symphony Orchestra’s (RSO) seventh chief conductor. After Denève’s ‘stunning’ stand-in debut in Stuttgart, the RSO management and artistic committee flew to Scotland to hear him conduct the RSNO at the Usher Hall. Discussions soon followed and, two months later, the conductor and orchestra had agreed on a initial three year contract. And, as one of the musicians, horn player Wipfler Wolfgang remarked, Denève is, ‘just the conductor we were looking for – an emotional musician’.